Putnam County @ Your Feet | Got GIS? This page is for the maps of Putnam County I will be creating. This will include geologic maps, social maps, and demographic maps. Pretty much anything related to Putnam County as I come up with it. The idea is to build layers, like in a cake, from the bedrock of the county up and up. The only think I do not plan on including on this page is the 911 data I am working with for the county. That will be showcased in another page. This is the first map in the Putnam County @ Your Feet series. 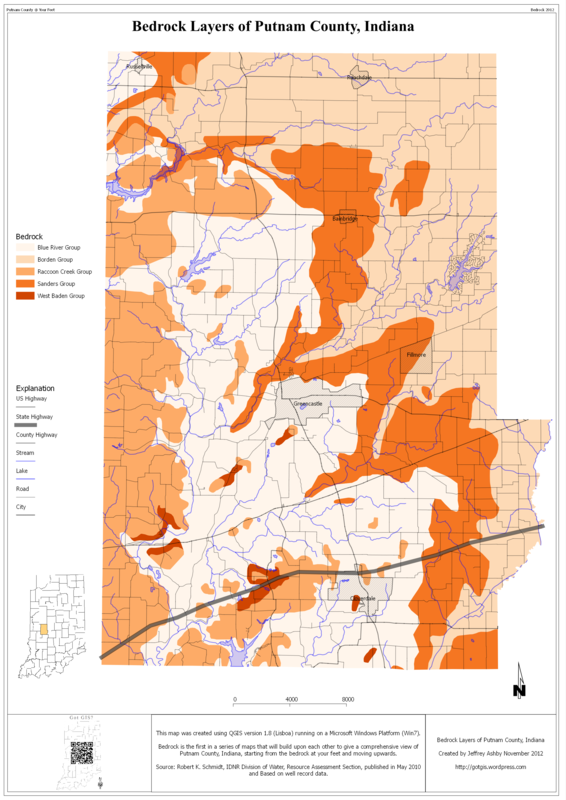 This is a map of the bedrock layers in Putnam County. It was made using data from the IndianaMap and Indiana Geological Survey using Quantum GIS. Quantum GIS, or QGIS, is an open source geographic information system that is powerful, flexible, and well supported with a vast array of plugins to extend and specialize its capabilities. The color scheme was chosen for its ability to show up well when printed on a black and white laser printer. Overall, with some fine tuning, this will be the general format of future maps in this series.